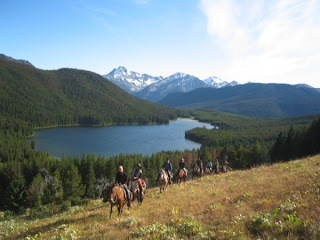 CANADIAN WILDERNESS CHALLENGE, read their experience with one of the best dude ranches of BC! "As this years challenge was slightly farther away we had a bit of a journey ahead of us. We flew to Vancouver with an 8 hour time difference we left London at 12:50pm and arrived on canada 14:25 (same day)!!! After arriving at the ranch and a tasty lunch, russ (our guide) showed us the map of where we would be riding and then Paul gave us a Bear Awareness talk!! (Putting our minds at ease?!) We got our saddles and introduced to our horses, mine was the cool 'Mr T'. 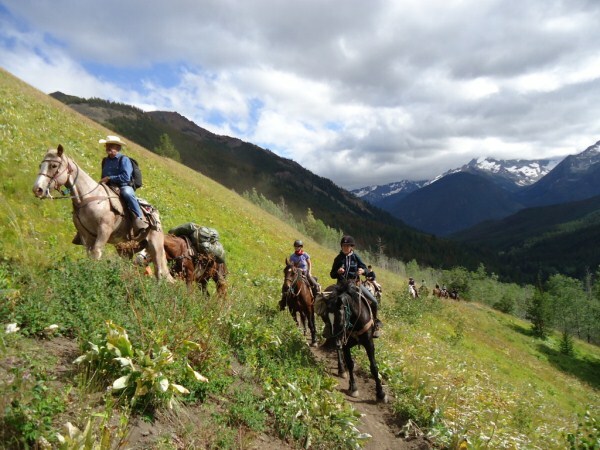 After an orientation; getting used to the western saddle and neck reining, we set off on a river ride. It was a great way to start the challenge. After a group picture we were set for our Challenging horseback pack trip adventure, it was a gorgeous day so we could take full advantage of the beautiful scenery as we rode through the forests and along the river to our first camp. About an hour into the journey word was passed down the line that a bear had been spotted but it was out of sight when I passed. We ate lunch in the hot sunshine at Eldorado Bridge. After turning the horses out to graze for the evening we had a lovely meal - lasagne , salad and garlic bread - yummy. We were treated to russ singing Cows with Guns on the guitar and few other cowboy songs. After a delicious breakfast of fruit and pancakes & maple syrup (yummy) we left the camp. The pland was to ride through the lower meadows but on a dighting of a bear we rode higher and higher to see if we can catch a glimpse. We managed to see the bear from a distance! Russ led us further up stopping about half way up at a viewpoint; the scenery around us was fantastic. We then rode higher up the mountain and climbed right to the top to about 8000ft - wow what an awesome panoramic view. We could see for miles and miles, looking out onto the coastal mountains with snow on the tops. 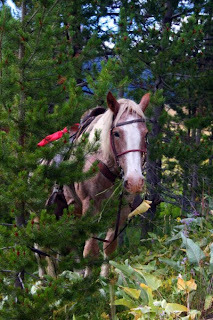 The horses had been fantastic and so sure footed walking up the hill. Our guides, Russ & Dale, worked so hard during our trip this morning I thought it was only fair to give them a hand with the saddles. Russ cooked us a hearty breakfast - tasty eggs, bacon, toast and fruit salad. The sky was clear and the sun was warm - another beautiful day. We arrived at the lake - wow it was a stunning lake; blue/green in colour from the minerals from the glaciers that feed into it. This morning I set my alarm early as I was joining Russ and Dale to gather up the horses at 6amish!! Once the horses were found they raced through the meadows and tracks back to camp, they knew exactly where they were going. All I can say is that we have certainly been well fed at the camp and I usually took full advantage of this! We left for our destination and once we reached the top we had hoped to see a herd of goats that another group spotted but they must have moved on. It was such a fantastic view that we lined up to have our picture taken. There was a large bank of snow so we got some pictures in front of that; Russ, Dale and Paul rode on the top of the snow which made a great picture. What is great about western riding is that you can mount and dismount from either side, depending on the high side (the one with the hill). As we approached a small meadow, there before our eyes was a black bear strolling through, we were so close to it we got great pictures. A perfect ending to the day. Above us on the hillside was a rock face covered in fossils, there were lots of fossils all around and even on the ground! A perfect ending to the day!!! It was fascinating to see Russ and Dale using the tracks made by the horses to find out where they were (or had been). It was so peaceful out there gathering up the horses. It was another glorious day, we couldn't have wished for better weather. We took another trail back to the ranch, it followed the river but quite high up we then descended down to the rivers edge and rode in the water. This was a bit more challenging, more for us than the horses and it was great! You could put your full trust in the horse, knowing they would not put a foot wrong. We had just completed a trail that had not been used for many years with pack horses - definitely an achievement to be proud of! Back at the ranch we retired to the comfy seats and Anne and Janie gave a speech thanking Russ, Dale and Paul for a fantastic trip, we really had an amazing experience. We celebrated with a couple of glasses of wine and Russ playing 'Cows with Guns' for a final time. After lunch we said our goodbyes and began the long journey back home. By the time we arrived in London it was about 2pm the next day. We said our goodbyes (quite emotional) and went our separate ways - jetlag kicking in later on!!! 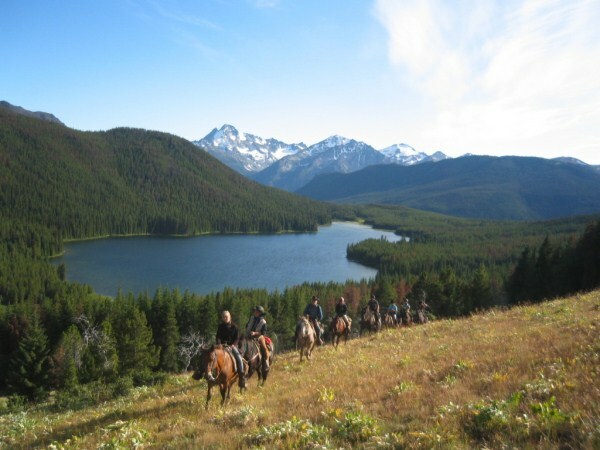 To book your customized trip with one of the best dude ranches of BC, whether it's a family holiday, a fundraising event or a solo journey call us on 250 238 2274 or send an e-mail to see what we have in store for you!